Most of SMEs and global companies in today’s era comes to a realization that they need a robust system to drive the business. In those contemplation, the only survivor visible is ERP. Thus, determining the cost of implementing occasionally becomes complex. The cost of implementing ERP in a small-scaled industry ranges from 10 lacs to 5 crores for a highly established organization. This is being the statistics that there is always a better technology with wider usability and options in ERP market. According to market experts, the actual cost of software application is a small portion of what vendor actually charge for it. Almost for every kind of application, there is always an undetermined recurring cost applied which effects the overall valuation in long run. Unfortunately, most of the organizations portray budget limitation on licensing fees and consequently neglect other variables which effects the cost. Usually, most of the implementation cost are predefined and discussed among both the parties i.e. Vendors and Clients to arrive at the desired profitability. While during the process of actual cost estimation, understanding the product plays a major role. This has been agreed with mutual consent of ERP consultants, key stakeholders and IT heads about the Project Implementation and development costs. This involves careful assessment of ERP functionality, the development scope and company appropriateness aspects which determine the selection of actual product cost. Type of Industry: Most of the ERP consultants believe that there are customization and functionality needed in some way or other to suit and map the industry functions. For example, an organization from chemical industry may have prerequisite of QC functionality which may not be required for an organization from retail sector. Similarly, production functions are applicable for any manufacturing organization. This deviation and customization applicability may be a deciding factor of the cost. Numbers of Users: Majority of the applications nowadays are designed on user authorization and limitation. This implies user specificity to the application which determines the kind and number of users expected to be working around with the system. Customization Required: It is understood that, the more customization required to build the ERP application for an organization, more will be the cost of implementation. This requirement is industry specific as discussed above. Database is the most common infrastructure that has been known for IT administration. The cost of hardware needed to run ERP application is included in infrastructure cost. All ERPs work on data handling and management which means that the level of transaction and data to be maintained are key to determine the type of database and the server to be initialized. Not only transactions, the top level management are keen on MIS and reports which are directly created and managed through the data stored. 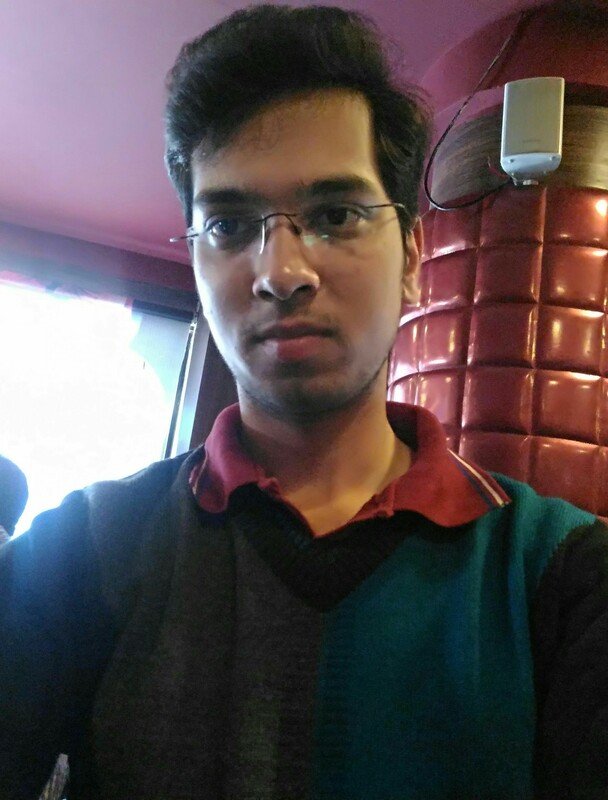 Thus the kind of data structure to be handled also comes to analyze the costing. For example, an in memory HANA database and server are costlier compared to the normal SQL database. 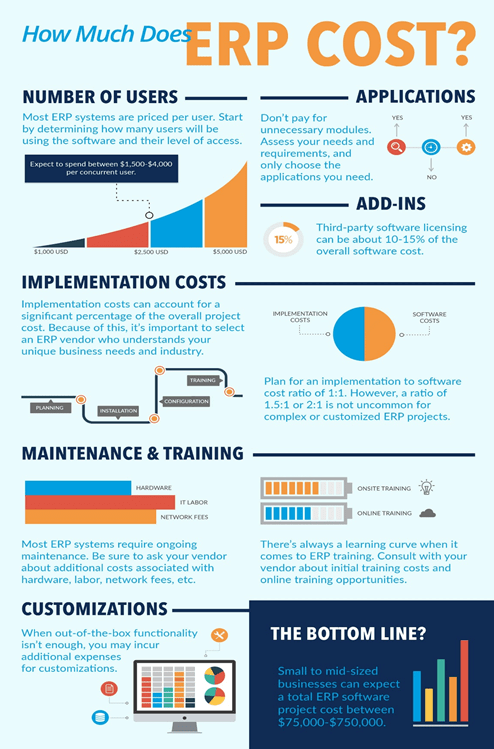 Most often, the cost of hardware run between 20% to 30% of total cost of ERP. In majority cases, the projects are outsourced to implement ERP, to provide support for secured implementation and to mitigate project failures. Here, the cost of consultation incurs as they charge the fees according to the project scope. Thus, more the complexity, more will be the fees for consultation. Development is also a big factor for determining the cost, as more the advancement in technology, the charge for hiring the experts are also stands high. As we know most of the ERP cost goes to Human Resources, because cost of employees/users accounts for more than 30-40% cost of ERP. ERP is an application which needs to be developed and implemented in a way such that it stays within the usability of the employees. The training and UAT is also an important phase for which the clients need to spend time and get trained themselves. Preparing with these typical factors, company may generally find it distinctive to arrive with the ERP implementation strategy. Moreover, this is need to be understood, ERP may cost heavily to customers but these are on other side are investments which secures and helps in increase in productivity. Having ERP is not the only step. Investing time and resources is where most of companies lack. According to new implementation process, planning should also be modified according to that. Thank you technodossier. Very informative…Looking forward for more such articles..